talking cube clock speaks the time on request. 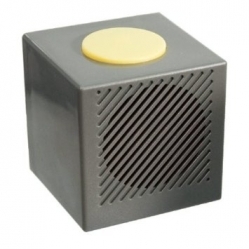 This talking cube clock speaks the time on request for people with a visual impairment.Simple to use Cube Clock announces time verbally in a natural, English male voice. Easy to use function buttons and audible cues for setting and alarming the clock. Choice of alarms available, including a mechanical bell, horn or cuckoo. Also features an alarm reminder and volume control. Excellent little talking clock that is so easy to use and set . Very happy with it.